One thing that’s always niggled me about WordPress is the search capability. While other area’s within the platform have improved over the years, especially in the back end, search has always felt a bit unloved. I’ve used plugin’s like the excellent Search Everything to allow for wider and deeper searching of my blog but I still wanted more, especially as content like my images are hosted elsewhere on Flickr. I’m now trying a new search solution, Viewzi Site Search, which in my opinion delivers a far better search tool than default WordPress. To see Viewzi in action type a word into the search box at the top of this page (if you visit the site that is RSS fans) and press return or click on Search. The search results will be returned in a far more visually rich style as seen in the screenshot above. Extracts for each post are shown with your search term highlighted. Comments and posts are also easily distinguished and you can easily turn off comment searching if you only want pages and posts to be searched. The results appear in a modal window above your blog page – click on a post title to jump to that page in the blog. So far I’m really pleased with the testing I’ve done and the accuracy of the search results. There are four blog ‘views’ currently available. The standard blog search works against your blog but you can also set up views for Video, Photo and Timeline. Video currently supports YouTube and Viddler accounts with more coming soon. Photo supports Flickr, SmugMug or Picassa. Clicking on Blog Photo will run a search against my Flickr photo’s, returning popular images in the modal window. Mouse over the image to display a higher resolution picture and click on the picture to go directly to the Flickr page for the image. Really pleased with how this works and beats having a local gallery installed on the blog. As a side note, the picture highlighted was taken in Aug 2007, the day the Apple store opened in Glasgow and also the day that Roy picked up his first Apple computer. It’s also one of the last images of me before I started losing some weight. What a difference! I look really fat in that picture compared to now. Anyway, enough about me. The Blog Timeline displays a nice scrolling timeline view of the search. This is really a nice to have compared to the other two views but it’s a view that I’ve looked at having before on the blog via a couple of plugin’s so it’s good to see it incorporated in Viewzi. Within the plugin settings you have some search stats available – number of searches per day, topics searched for etc. Standard fare really. One issue that may put people off is that adverts are displayed amongst the search results. These are adverts placed by Viewzi. i don’t have an issue and they are working on ways of incorporating your own adverts into the search results. Once in place your adverts will be displayed 50% of the time and theirs 50% of the time. Sounds fair and if your desperate to set that up now you can contact them for more info and help. Search results return tags and categories associated to posts that can be clicked on for more deeper browsing. Support of additional search views – my comments from other sites through Intense Debate, del.icio.us links, Google Reader shares etc. 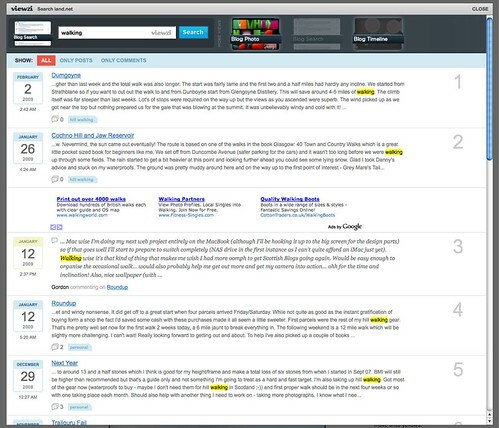 Ability to search across all views via one search, returning results based on priority and relevance. Greater control over the modal form – CSS styling to allow alignment with blog design. As a package I’m really impressed so far. Easy to set-up, no styling required and search results delivered quickly with hopefully more sources covered soon. I did also look at Lijit which offers much the same promise as Viewzi with many more supported sources but the results returned weren’t as well styled as with Viewzi or as well integrated. Overall Viewzi is a plug-in that is well worth trying if the default WordPress search isn’t quite doing it for you. I tried CoComment a couple of years ago but was never satisfied with the service. Disqus and IntenseDebate looked to be better options but I never liked that the comments were stored elsewhere and not on my site. For me to commit to a service I wanted to be more in control of comments and be in a position to move them to where I wanted at and time. However there’s been a couple of changes recently which has made me move to installing IntenseDebate on the site. Firstly IntenseDebate have been bought by Automattic, the people behind WordPress and a few other services. This gives me a lot more reassurance that the service will be around to stay and that it will be enabled on a lot more blogs in the near future. This should make it easier to track conversations across the many sites I read. Secondly, both Disqus and IntenseDebate now support syncing of comments so that the comment exists not only on a remote server but on your local blog installation. There are many features within the IntenseDebate pluging – threading, comment moderation, commenter profiles including reputation points and many more that are covered on their website. There is also an excellent dashboard that pulls together comments on your own posts and comments you have made elsewhere, but only on those sites that have also signed up to IntenseDebate. I’m hoping that with WordPress 2.7 coming out soon which starts to include some of the functionality of IntenseDebate and also the availability of the new plugin will lead to an increase in the services support across many more sites. However please do let me know if you hit any snags when commenting – at the slightest wiff on any problems I’ll move back to the old system. However there are no issues so far for me so here’s hoping for plain sailing.